In the past couple of years, IPAs have taken America by storm. Everywhere you look, there are more and more IPAs popping up. As IPAs continue to gain popularity, Hop Heads all over the country are experimenting with recipes that take IPAs to new levels of intensity--higher IBUs and ABVs. It’s a fun and exciting brew-movement that we at BJ’s Restaurant & Brewhouse decided lines up nicely with our philosophy to constantly push the envelope. After doing some experimenting of our own, we finally landed on a wickedly good recipe for a Double IPA that is a Hop Head’s dream. 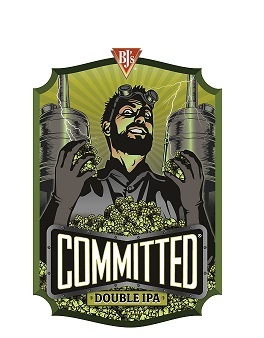 We proudly introduce this new and intense brew: Committed™ Double IPA. Committed is brewed with a boisterous amount of hops including Simcoe, T-45 Cascade, and Columbus hops. Trust us; the great amounts of premium hops in this beer will slap you in the face with a hop-bomb in the absolute best possible way. The punch that this beer packs will give you a truly flavorful and sensory experience that all of us beer lovers crave. “Committed” was a word that fit this beer because it is also a beer that you need to be committed to when you order it. With a 95 IBU and 8.6 ABV, this beer is not a sipping beer, nor is it an entry level beer; this is a beer that means you are going all in. So be committed and prepared for one intense beer experience. Furthermore, we decided to name this beer “Committed” because it is a beer that we were truly committed to getting right, as a scientist is committed to cracking the code or finishing the invention (hence our eye-catching logo). We are committed to brewing the best possible beers for our guests, and this beer is an example of that. Committed Double IPA is now available at all of our restaurants. This is a great beer to try with a meal that is also intense in its own way. Try it with our New Orleans Jambalaya or our Cajun Chicken Pasta. Of course, this is a great beer to enjoy all on its own as well. Remember, Committed™ Double IPA is only here for a limited amount of time, so get it now while you can!